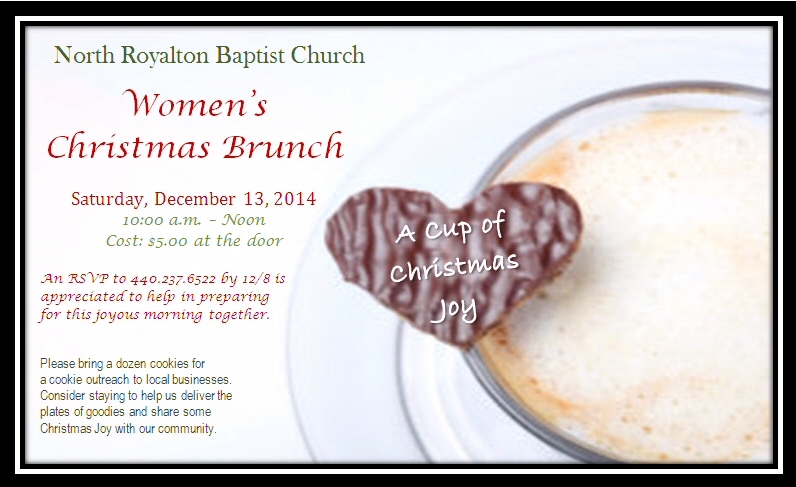 Saturday, December 13, 2014 from 10:00 am – Noon, a Women’s Christmas Brunch will be hosted by the “Open Hearts” group. $5.00 at door. You can pick up your invitation in the foyer. We have special invitations for inviting a friend if you wish to treat them. They have a “special friend” red circle on the lid. An RSVP to 440.237.6522 by 12/8 is appreciated to help in preparing for this joyous morning together. Please bring a dozen cookies for a cookie outreach to local businesses. Consider staying to help us deliver the plates of goodies and share some Christmas Joy with our community.